Do You Speak ‘Proper’ English?! Good morning, Bonjour, Guten Morgen, Buenos Dias, Buongiorno, Shubh Prabhaat, Sabāḥul kẖayr. English words I find especially so – as I am British ( I say British as I do not consider myself English; I have Irish parentage, with Scottish and Cornish ancestry) and we are an extraordinarily mixed race that has absorbed, from countries across the world, words that have become embedded so deeply that we have almost forgotten the origins. I love the etymology of words, names, nouns, things, stuff, anything! I think I may have mentioned in a previous post the origin of the word orange – it is from the Persian, narange. Language changes can denote when a country was historically invaded, when merchants brought more home than products and coin, when integration was necessary. Language is a living, ever evolving, and fascinating marker to our connections worldwide. My previous snob of a self used to scoff at ‘Americanisms’ – i.e. garbage, diaper, aluminum. These words travelled from Holland and England to the New World and remained in use alongside those from farther afield. Now I understand the use of garbage, as compared to rubbish; it makes sense. Plant, wine, cat, candle, anchor, chest, fork, rose – Roman, circa AD 410. Birth, cake, call, egg, freckle, happy, law, leg, sister, smile, trust – Old Norse, circa AD 900. Army, archer, soldier, Crown, throne, duke, nobility, peasant, servant, obedience, traitor, felony, arrest, justice, judge, jury, accuse, condemn, prison, gaol, ballet, café, genre, garage – French, circa 1066 to present. Boss, coleslaw, landscape, cruise, frolic, rucksack, roster, wagon, onslaught – Dutch, various. Abseil, angst, cobalt, delicatessen, doppelganger, dachshund, fest, haversack, kitsch, kaput – German, various. Veranda, jungle, bandana, chit, dinghy, pyjama, juggernaut, cashmere, thug, shampoo – Hindi, circa 18th and 19th c.
Banjo, chimpanzee, zebra, zombie, banana, jazz, cola, bozo, boogie, okay – Africa, circa 18th and 18th c.
Alcohol, algebra, chemistry, elixir, cipher, zero, zenith, alcove, amber, assassin, candy, coffee, cotton, mummy, racquet, sash, crimson, ghoul, giraffe, lemon, orange – Arabic, various. Flannel, corgi, penguin, pendragon, bard, balderdash, druid, crag – Welsh, various. Blackmail, clan, glamour, golf, scone, wraith, tweed – Scottish, various. Looking into the origins of some words provides us with, not only origins and meaning, but the circumstances under which such words have entered the English language. I think we should be proud have having such connections and ability to borrow, adapt and absorb words into our everyday use. It makes me feel I belong to a greater community. The Adventure of English by Melvyn Bragg. Posted on July 10, 2017 Categories WordsTags Adventure, Africa, American, Arabic, Dutch, English Language, Etymology, French, German, Hindi, humour, Melvyn Bragg, Monty Python, Old Norse, Persian, Roman, Scottish, Welsh, WordsLeave a comment on Do You Speak ‘Proper’ English?! 1. I wanted to be an artist, and 2. I did NOT want to be an accountant. My mum would have had me learn to type and get a good secretarial job. So off I went to art college. I hate maths with a passion, I cannot emphasise how much numbers do NOT thrill me, in fact, I could go as far as to say, numbers frighten me. I think I might have dyscalculia (Like dyslexia but with numbers). I forget numbers, I’m rubbish with formulas and sequences (I even forgot my home phone number on more than one occasion); which brings me to Elton D Philpotts (If you want to know what the D stands for, you will have to read the book!). Elton D Philpotts does not have dyscalculia, he does not struggle with numbers (at least, not in the regular way), he does in fact, have an extraordinary memory with regard to figures. He can see a sequence once, and remember it, and it is this ability that winds up with him in deep space. Deep Space Accountant is, as can be easily surmised from the title, a sci-fi novel. The protagonist, Elton D Philpotts, is an unlikely hero. He is the common man, he is a ‘regular guy’, a normal bloke, like most of us. He is at a stage when he is questioning his career – is this all I have managed to do so far with my life? Many of us have asked ourselves this question, but Elton’s friend Walther persuades him to apply for a new post (The pre-interview sequence is hilarious). Elton makes a discovery that will change his life, meets new people that will also add to that change, and discovers a new side to his own character. Philpotts is a Relativistic Accountant, who values assets that may be travelling at nearly light speed. Because time passes at a different rate relative to back home, it means that assets will depreciate in value at a different rate. Mjke Wood has a very quirky sense of humour, and a very affable style of writing. I found myself smiling at unexpected moments – when the heat is on, he throws in humour (or a ‘pig’. Again, you’ll have to read it to find out!). I do not mean that to sound like he randomly adds the humour, there is nothing random about this story. It is obvious that a lot of research has gone into it. The world, or worlds, of the future are fully realised, the science is totally believable – to me at least, and the plotline is flawless. It’s like ‘The Office’ meets ‘Buck Rogers’. Because of Wood’s writing style, the technology, and there’s lots of it, is not overly difficult to comprehend and often has comical consequences; like the smart clothing named Jim or Kim, depending on the wearers birth gender. There is attention to detail, from how a common-or-garden drinks machine is powered to how starships travel, relativistically speaking. Deep Space Accountant has spaceships! Anarchists! Worms (yes, worms!) and invoices! You can find your copy of Deep Space Accountant as a paperback and an eBook on Amazon. It’s also on iTunes and Kobo. Also by Mjke Wood – ‘Travelling in a Box’, a family’s experience of holidaying abroad in a caravan. Available at Amazon. 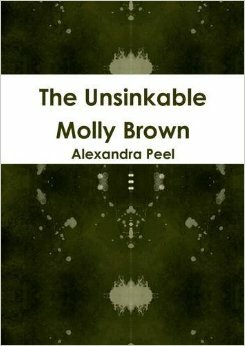 Molly Brown, a runaway orphan heads out to sea as the unlikely Captain of a Pirate ship. Meeting new and unusual friends on the way, including a talking cat, she is a fearless, imaginative and feisty girl. Aimed at readers aged 8 to 12 years. A number of years ago a film hit the big screens – a story of love, bravery, inspiration and the British class system – that film was Titanic, starring Leonardo DiCaprio and Kate Winslet. I thought it was a disaster – much like it’s theme of the titular, doomed vessel. It began me on one of my mini obsessions. I began reading about the real Titanic, its construction, the men involved in its design and realisation, the great day of launch and the journey. A huge, stylish floating village with everyone in his or her place. The nobs at the top, the poor Irish in the lower decks and engine room. We all know what happened. But one person really stood out for me, Margaret Brown (July 18, 1867 – October 26, 1932). She was an American socialite, philanthropist, and activist who became famous because of her survival of the of the Titanic disaster. She took command of the lifeboat she was placed into and demanded the crew of the lifeboat to return to look for survivors. She became known after her death as “The Unsinkable Molly Brown”, and her image loomed large in my mind. Wasn’t this the sort of role model/heroine our young girls should look to, not the skinny models and ego fragile celebs flaunted daily in the media? And so I wrote my book for my daughter. It took a long time – too long. By the time I decided to self-publish, she was too old to read the printed copy, but she did act as my proof-reader when she was a child. Bless her.